That's usually the first thing I hear when I see my aunt and uncle from the southern part of the state. I don't have to ask "which garden" because I know they are asking about my vegetable garden. They also have a vegetable garden. We compare notes. They plant their garden earlier, usually by several weeks. Then they often use a hotbed to get a jump on the season with lettuce. Their okra, pictured above, is always taller than my okra and they have more of it. 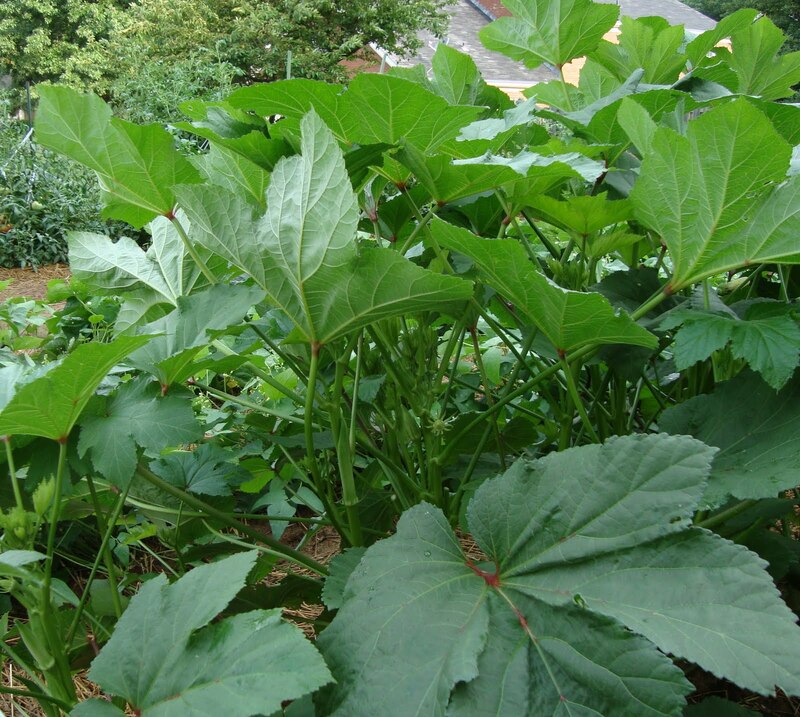 Their okra is about five feet tall now and they have 24 plants. They pick from those plants every two days or so. My okra is about three feet tall and I have about six plants. 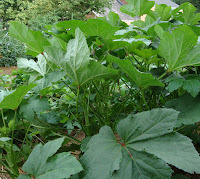 I should pick okra every two days or so, but I don't think I eat it as often as they do in the summer time. My uncle grew his from seeds saved from last year, the variety 'Emerald Green', so that's the variety I grow, too. Goodness, I can't imagine what they are doing with all of that okra. They sent me some pictures to show me. That's okra with tomatoes in the bowl in the upper left of the picture and fried okra in the bowl in the bottom right. I think they also give away a lot of okra. They also give away a lot of tomatoes. My aunt said they are currently eating about five tomatoes a day and give a lot of them away to family and friends. 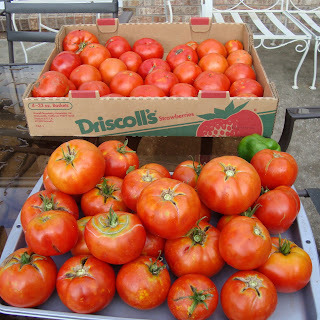 I think I grow more varieties of tomatoes than they do, but when those 'mater plants are producing, I eat them every day, too., and I give some away. One of their favorite varieties is 'Celebrity'. My favorite is 'German Johnson'. Growing up, I suspect my aunt spent quite a bit of time helping my grandma put up a lot of canned tomatoes, maybe pickled okra, definitely bread and butter pickles, I think, and anything else they were going to eat during the winter time on the farm. My aunt says she remembers going down to the cellar and getting cans of beans, tomatoes, peaches, and who knows what else to make supper. Canning was a way of life in the summertime. Now a days, my aunt doesn't can many vegetables though I think if you grew up canning food, it's not easy to give up the habit of doing so every summer when their is so much excess coming from the garden. Most of the people I know who still can vegetables, do so because they like the taste better not because they'd go hungry if they didn't. I don't can or preserve anything, for the most part, though I have made grape and strawberry jam before and frozen hot peppers. My aunt and uncle will not lack for green beans, should they decide to can some. That's okra on the right, by the way. Five feet tall! I will lack for green beans as mine dried up in the heat when I was gone. I like how they put straw down in between the rows. It sure does keep down the weeds and gives the garden an overall neater appearance. Plus it helps retain moisture, which was very much needed in July. The entire garden looks neat and well kept with healthy plants. I think I'll get some straw next year for the paths in my garden. Overall, I'd say their garden is doing pretty good. I'd say, "Not too shabby!" to your aunt and uncle. 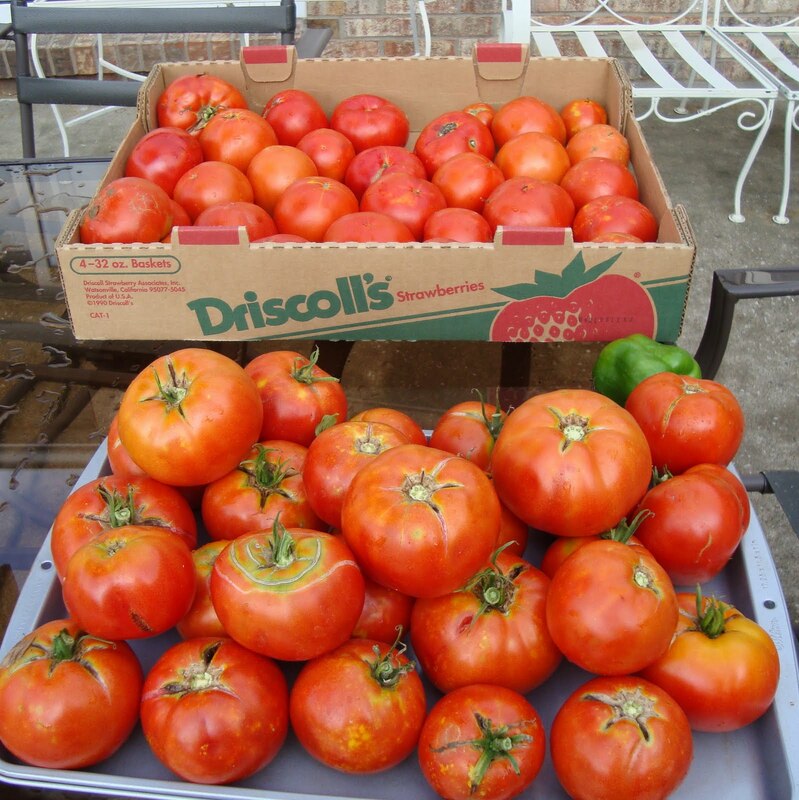 We are just starting to see ripe tomatoes. The Cherry Tomatoes are always first...beans are coming and zucchini and baby carrots. It's been pretty fair considering the high temperatures. Peppers seem to not do so well, always late, if they come at all. Cherry tomaotos are plentiful. Didnt plant beans, tasted like grass last year, didnt want to waste space in raised bed. I wish I had more room for veggies in my garden. Maybe, next year. Most/all of my veggies are in containers. And unfortunately, it has been so cool here that my tomatoes aren't even showing the slightest hint of ripening....maybe by September. This garden reminds me of my ex in-laws who had a huge vegetable garden to feed their 11 children. 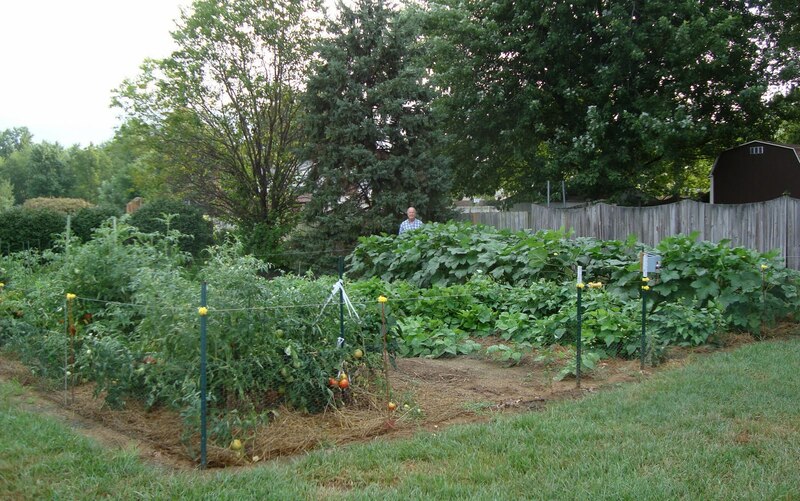 As the children grew and left home, their garden did not decrease in size. They just sustained the whole neighbourhood in fresh vegetables. To this day, my 85 year old father-in-law is still out there at 5 AM weeding and tilling. Proving once again that gardening keeps us young. What a gorgeous garden! I definitely want to use straw in my next year, my weeds are growing magnificently. Our garden feels so proud to be a part of your blog. Those plants are strutting their stuff Ha. Lovely Garden! 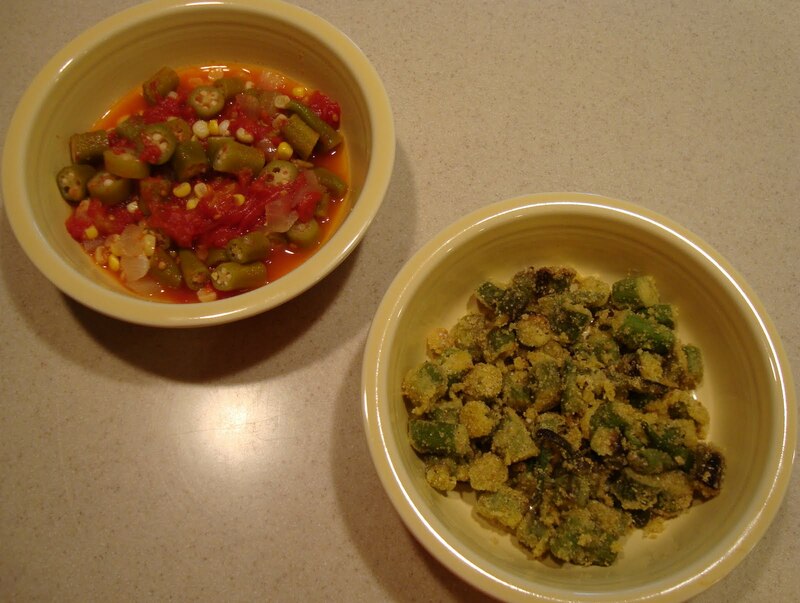 I am so envious of the nice okra, my mother was from S. Carolina so I was raised on it. I love it just boiled with cheese. Here in the PNW it is too cool and the nights are too cool for it to do well. I have grown a few tiny plants with a few tiny pods. But I should try some other varieties. And I have read you can eat the leaves, like a lot of other Malva family plants, though they are very mucilaginous like the pods; but I like that. I just posted about my garden on my blog, I've been getting a lot of cucumbers, first tomato this week (Tricot Czech), a couple of crookneck squashes, my first runner bean (Insuk's Wang Kong) yesterday, and lots of little beans and green tomatoes coming on. The corn has tassled, the tomatoes are slowly coming in, green beans and peas went phhhht, as did the row of cilantro and dill. It's a new garden space as moved it to a bigger area, so we are starting over with the fertility of the soil with compost and good dirt. It used to be a sand volleyball pit from a previous owner, so it's a work in progress. It was the same with the old veggie garden and it turned out fab by the second year. My tomatoes haven't even flowered yet! However, my pumpkins are starting to show some fruit and I harvested the first bunch of peas the other day. I have some okra plants going on 4 foot tall. That's all that will produce in the heat and drought. Water bills are getting too high. We are only growing corn and tomatoes. We are growing 13 different kinds of tomatoes. We are enjoying them every day but I don't think we have eaten five in any one day. The tomatoes did well, and I had a few eggplant and cucumbers. The chard's hanging in there. I'm nurturing two tiny honeydew melons, but in this drought, if the heat doesn't get them, the critters will. 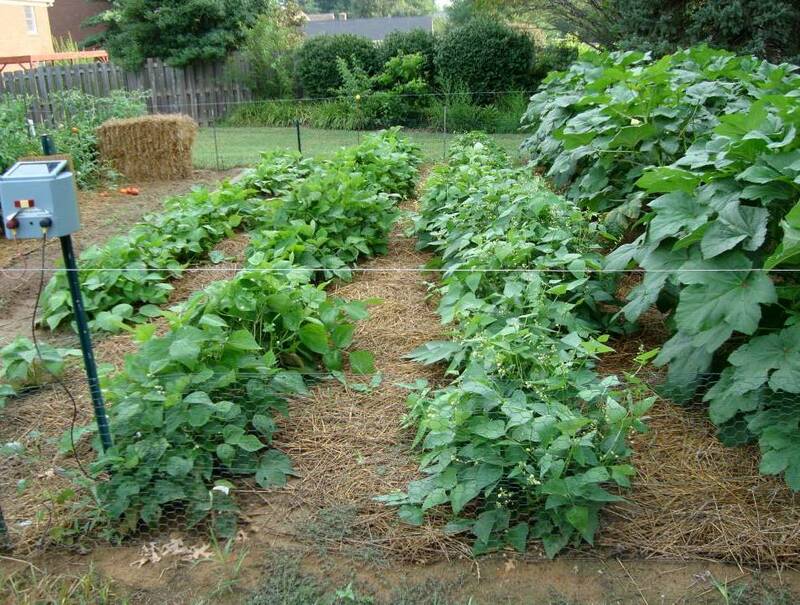 Your vegetable garden looks just lovely.